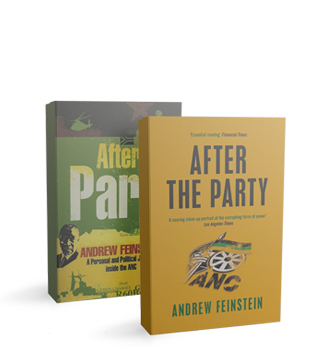 Andrew Feinstein became an active – and ardent – member of the ANC in the 1980s, and campaigned energetically for the party in the first democratic elections. He was elected to parliament and rose swiftly through the ranks, earning the label ‘Mr Clean’ for his unstinting work against graft and corruption. But his feelings of euphoria at being part of the new South Africa slowly soured. Initially disappointed by the constant jockeying for power and the denialist AIDS policy of President Thabo Mbeki, Feinstein’s disillusionment grew as he sought unsuccessfully to investigate the corruption surrounding the Arms Deal. Isolated from his former comrades, Feinstein was forced to choose between his principles and the party he had so admired. A hard-hitting, searingly honest and indubitably courageous account of the author’s personal and political journey into South Africa’s post-apartheid parliament as a member of the African National Congress – and his departure from it over the failure of the party leadership to support any parliamentary enquiry into a notoriously corrupt arms deal; it also leads the reader to the heart of South Africa’s politics over the last decade. It is an indispensible read for anyone interested in understanding the challenges and dilemmas of contemporary South African politics. Anyone wishing to understand what has happened to the South African dream must read this book. Enthralling and lucid, it shows how the political successors of Nelson Mandela lost their way and South Africa lost the moral high ground. An eyewitness account of the colorful court of President Thabo Mbeki, this authoritative memoir reveals and explains while remaining balanced and fair in its judgments. Gripping in its blow-by-blow account of how international arms companies corrupted South Africa's young democracy, and heartbreaking in its portrayal of an honest politician's attempt to keep his government clean, After the Party is an enthralling read. As this book makes clear, every budding African democracy would benefit from a plethora of Andrew Feinsteins. Principled, anguished and sincere, he is the kind of man who cannot help doggedly holding power to account. This important and brave book illustrates the extent to which South Africa's multi-billion-dollar arms deal has undermined the rule of law, accountability and constitutionality in the country. It provides compelling evidence that corruption linked to the deal and the mishandling of the AIDS pandemic marked the point at which our young democracy lost its moral compass. It also speaks to the virtues of a transparent, accountable politics of principle that is needed in SA and so much of the world.